Let’s, for the suitable sake of brevity, forgo the preamble. Pound for pound, the four nights I spent at the tenth edition of Curtocircuíto last month ranked—geographically, socially and cinematically—among the best I experienced on the festival circuit last year. To be sure, a bona fide dud was hard to come by in the 2013 programme—remarkably so, given the scant time (a month, I’m told) in which new festival director Pela del Álamo and his close-knit team had had to put everything together. Santiago de Compostela’s international short film festival, which ran 9-13 December, may have downsized in recent years, but such moves stop what may well have been something of a rot, putting short shrift to the false assumption that each new edition of a festival needs to be bigger than its predecessor in order to be better. Indeed, just as del Álamo noted in a public discussion that length should make no difference as to the artistic value of a film, size alone is no barometer of an event’s cultural standing. For at least five December days in Spain's historic pilgrimage city, found in the northwest region of Galicia, quality was very much at the forefront. This isn’t to say Curtocircuíto’s programme was sparse. It boasted several competition strands, over two of which I presided with fellow jurors Eulàlia Iglesias, Luis E. Parés and José Manuel Sande: these were the International Competition and the Explora section. The ten shorts that comprised the latter strand in particular were all notable in some way. Furthermore, their order demonstrated a canny curatorial knack on the part of del Álamo and co.: though ranging wide in aesthetic terms, each short had some kind of common thread, thematic or otherwise, linking it to the films that both preceded and followed it, so that a one-sitting consumption of the entire section flew by whilst frequently renewing one’s interest (all too often, shorts programmes are poorly curated). One film competing in the Explora section was Lois Patiño’s Montaña en sombre, which I wrote about from Berwick in September. While on that occasion its projection onto the wall of an old prison cell gave the film a stereoscopic texture, however, the more straightforward exhibition space of Santiago’s gorgeous Teatro Principal emphasised just how beautifully contrasting the film’s sharply defined blacks and whites are. Patiño, who received the CREA Award for Best Galician Director as well as a Special Mention from our own jury, is an expert and natural image-maker. 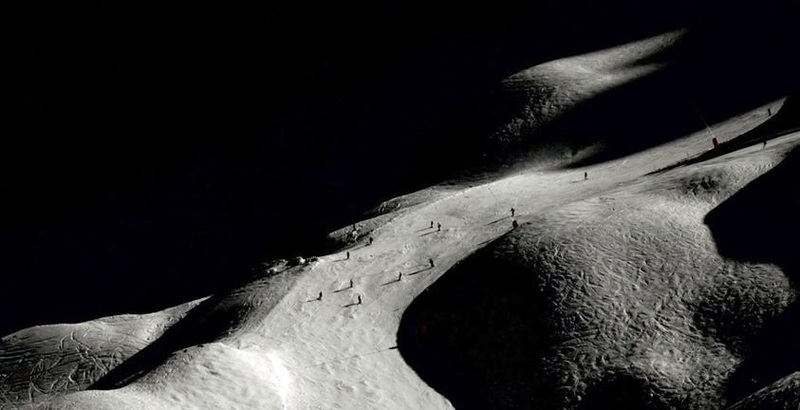 A wordless documentary on a group of skiers ascending and descending mountainous slopes in Iceland, Montaña’s compositional and imagistic strengths stem from its tension between light and shadow, the human and the elemental, the intimate and the detached—this latter binary a result of what might be the filmmaker’s simple but profitable signature, of shooting from afar while honing in on the more private sounds of the figures he’s filming. Montaña’s most identifiable tension, perhaps, was that between the abstract and the concrete, as encapsulated best by that shot of skiers descending a slope via a particular winding route at night, their red safety lights creating a bedazzlingly fluid line that cuts through the otherwise shadowy and hostile terrain. A similar and amusing riff could be found in Mels van Zupten’s On a Saturday Afternoon, which upon opening I took to be an animation: five or so thin ink or pencil lines, running vertically like violin strings against a block-white background… Then, at the top of the screen, a foot emerges, then another, dangling and edging steadily downward into frame. The lines belong to abseilers—all of whom proceed, in stop-start rhythms and at different speeds, to and beyond the bottom of the image. Van Zupten’s four-minute short was not alone in fulfilling a simple conceptual brief. Elsewhere, R. Mond and Yuri A’s Family documents three decades in the formation and evolution of a family through a quickfire chronological succession of monthly passport photos, which unfold to Michael Bucher’s upbeat electronic soundtrack. Context is scarce and information is scant, but some research tells me that the curiously monikered authors provide the film two of its four faces; the physiognomical shifts captured by their ongoing project are amusing, fascinating and even touching. Family was one of several Explora shorts that repurposed archive images into new narrative contexts. 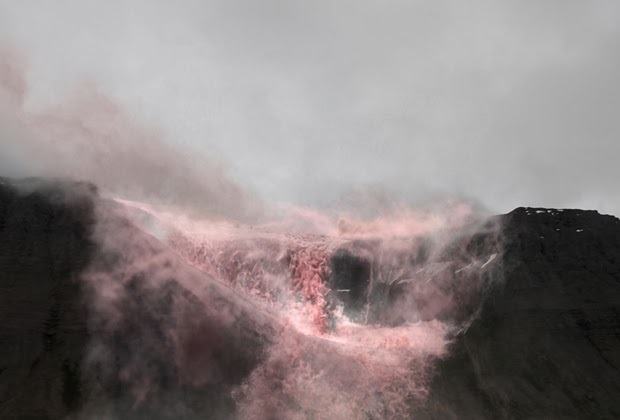 Thibault Gleize’s Exland adds to images of volcanic terrain a computer-generated substance—something between candy floss and raspberry-coloured lava—that engulfs the landscape with a synthetic rumble, while Claire Sichez’s The End magnifies the melodrama of old B-movies by rotoscoping facial expressions onto the found footage. “The rumour spreads”, so reads The End’s one-line synopsis given in the festival catalogue: is our own denouement to do with our wholesale consumption by animated avatars? Whatever, for our jury at least, Jean-Gabriel Périot’s The Devil stood out as the deserving winner of the Explora Competition. This too reconfigures familiar archive footage—of the Civil Rights Movement—into a powerfully rhythmic, seven-minute historical overview expertly edited to a song by the one-man French band Boogers, whose confrontational lyrics (“if you look upon my face / you are watching now the devil”) give the film its ironic title. You can watch it here.